It is little known that the Mark VIII was almost a contender at NASCAR. Chevrolets had won 31 of 46 Winston Cup races since the redesigned Monte Carlo was introduced in the 1995 model year and racing season. In 1996, Ford had no plans to update its 9 year old Thunderbird in the near future. The next year, Ford announced that it would discontinue the Thunderbird, one of the most successful brands in NASCAR history, at year’s end. In 1996, Michael Kranefuss, owner of Team 37, saw the Mark VIII, which shared the MN-12 platform with the Thunderbird, as the logical replacement. 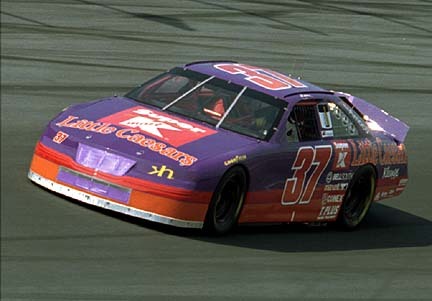 The team built a NASCAR car based on the contour of 1996 Mark VIII. Wind tunnel tests were done on the completed car at the Lookheed plant in Marietta Georgia on May 7, 1996. The car attracted a lot of attention during the two day test at the Charlotte Motor Speedway on May 8-9, 1996. John Andretti drove the Mark VIII for those test laps, recording one of the highest speeds for those days. They were the focus of attention not because of the lap times but because it was a Lincoln Mark VIII. NASCAR officials said they would allow the Lincoln Mark VIII to be used in Winston competition, but Ford asked the team to stop the development program. "Ford's foremost objective is to sell cars," stated Michael Kranefuss, who has a 30 year association with Ford. Ford wanted a sales leader represent Ford in NASCAR. Also, at the time, Ford did not want Lincoln to have a race image. In 1997, when Ford announced that the Thunderbird was to be discontinued, Ford got special permission from NASCAR to campaign a two door Taurus for NASCAR for the 1998 season. Special dies were made up for the skins of this racing Taurus that was optimized for aerodynamics. No Two door Taurus was ever offered in the showroom! So much for "stock car" racing. Mark VIII, it could have been a contender! Models of the 1996 Mark VIII Winston Cup car were produced. A 1/10th body was made by BoLINK for radio controlled cars and a 1/25 scale resin model was made by SMH Resins. The BoLINK car has been discontinued, but you may still be able to get the resin kit fro SMH Resins at 1111 Floral Drive, Lenoir, NC 28645 (704) 726-0777. See Models for pictures of these models. Special thanks to Rex Holder for finding a picture of this little known car.